A volcanic-formed tissue dispenser, that works like a paperweight. 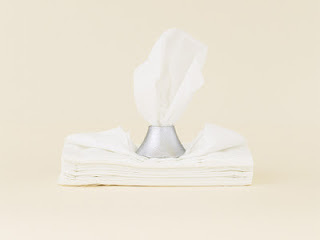 A dancing 'volcanic smoke' look is created by sliding tissue paper through the center hole. The concept is not 'how to cover', but 'how to show' the contents. Got to hand it to those clever Japanese designers. Strap yourself in for the ride of your life. The C-124 Cargo Bed fromMotoArthas all the right hooks to make most people blush. Constructed from two authentic cargo floors, it includes the original tie-down rings that once strapped down tons of precious military cargo. Each bed frame is custom cut to accommodate the bed size of your choice. 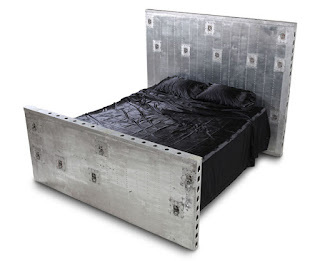 Sanded to a raw finish, it includes a leather padded footboard with extra hooks. The Fairchild C-119 rudder desk is truly a limited edition with, currently, only 40 frames available. The original cloth cover on this 1950’s rudder is stripped to expose the interior design. Mounted on 4” hardwood “V” shaped legs, this richly detailed piece can be powder coated to match your home or office décor. This executive desk measures 8’4” in length, or it can be customized to an extended length of 11’ as a handsome conference table. 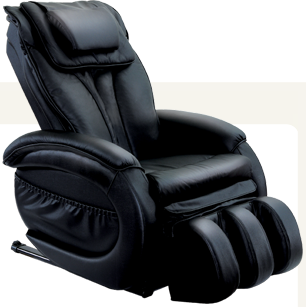 After a long day at market, this chair from Infinite Therapeuticsdelivered the ultimate in massage therapy. It seemed like it knew just what we needed (and just where we needed it!) 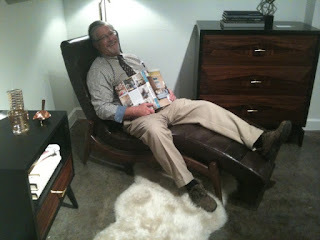 The chair’s optical scanners actually scan your body automatically detecting nagging aches and pains. It then automatically delivers a custom massage. And quite possibly, a longer life! Fun, funky, and unique, while wandering aimlessly in Market Square we saw Sugarpost's award-winning metal art and fell in love. One of the coolest showrooms was Four Hands. Very industrial and reclaimed with a large dose of beautiful design. Carl takes it in. Carl and Drew's Excellent Adventure! We are at Market in High Point North Carolina revving up for our very excellent mission...uncovering really cool stuff for our showrooms. We will be peppering these pages with some of our finds. Right now, here are a few candids. The designers at Renovo chose wood as the material of choice for bicycles because of its excellent properties. They are all a little mystified that they can actually make such an amazing, beautiful thing. When you ride one, you will be mystified too...by the smooth, quiet, magic carpet ride. We also found this great place to hang! The Little Mermaid has a secret admirer. 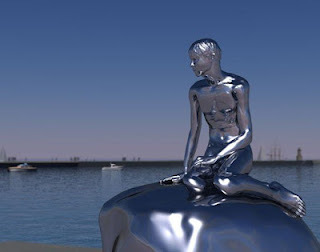 Elmgreen & Dragset, the artist duo that gave London the oversized rocking horse on Trafalgar Square's Fourth Plinth, has dreamed up a male companion sculpture for Copenhagen's Little Mermaid, though "Han" will pine for her from Elsinore's harbor, not far from Hamlet's digs at Kronborg Castle. Han is a pretty sleek guy: His skin and perching-stone are both polished stainless steel, and once an hour—in a deliciously creepy twist—he’ll blink for a split second, thanks to an internal hydraulics system. What do you think: Will he be as iconic as Copenhagen’s mermaid? Seeking a simple sustainable life immersed in scented trees? Architect Andre Eisenlohr's breezy Eucalyptus Houseis a low-impact wooden shelter that stands on stilts. 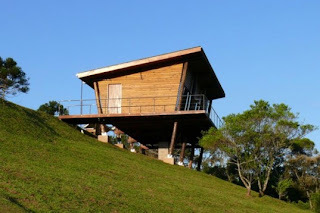 Situated in a forest reserve area close to Sao Paulo, it makes the most of a neatly organized single level. Fitting a bedroom, a bathroom and an integrated kitchen and living room area into a small but well-thought-out space, this compact eucalyptus home rises above the forest. 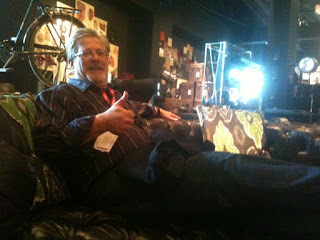 Thanks to our friends at inhabit.com! Sometimes you just need to put your feet up and relax. 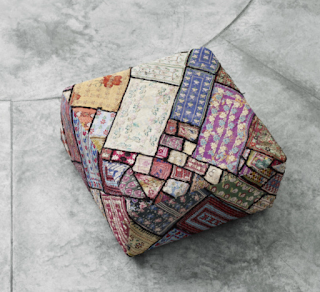 This ottoman from HAY is made from a patchwork of fabrics from traditional Afghani and Pakistani selected by HAY designers and put together in squares filled with traditional embroidery and tiny mirrors resulting in one of a kind ottomans – each with its very own identity. 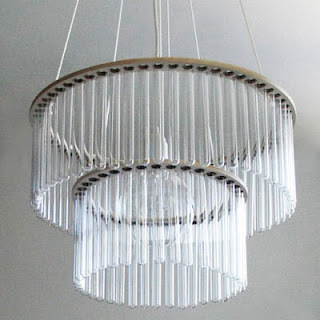 The Maria S.C. lamp, designed by Pani Jurek, looks like a crystal chandelier but is actually made from chemistry test tubes placed into circular plywood bands. 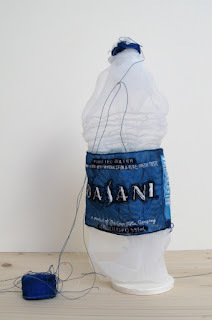 Not only is this a cool use of materials, but you can fill the tubes with colored liquid and “experiment” to create your own chemical reaction. The lamp design was inspired by Polish scientist Maria Sklodowska-Curie, who was awarded the Nobel Prize in Chemistry for the discovery of polonium and radium. 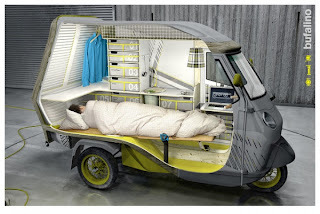 German industrial designer Cornelius Comanns transformed a Piaggio APE 50 tricycle into a small one man camper. 'Bufalino' offers absolute flexibility during periods of travel. Niels Bach Møbelfabrik specializes in high quality furniture in exclusive designs and finish, in solid teak, oak and steamed beech. The company was established in 1919 and is today one of the leading manufacturers of high quality Danish furniture. This gorgeous Solid Oak Dining Table was a special order for one of our good friends. Nothing fancy, just clean, solid design. Which in our opinion, never goes out of style:) Here's more. 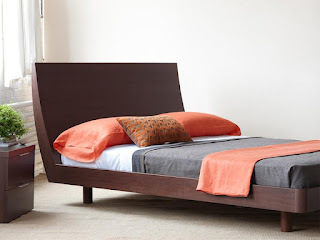 Going beyond the normal reclaimed timber yards, East London Furniture makes furniture from 100% recycled materials. All materials used are salvaged from waste, meaning that most materials used in the products have been diverted from landfill. Thistapered leg coffee table is made from a reclaimed plywood top and industrial rubber coated feet. 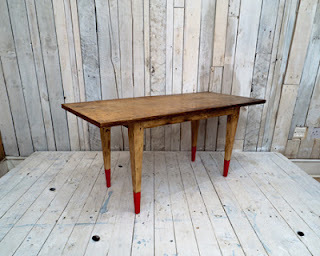 Reclaimed may not be your style, check out some of these cool dining tables. Piniwini design by Linus Svärm is a small wall-mounted peg that works like a shelf. 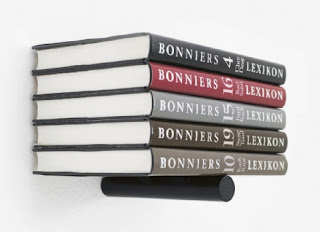 The ingenious patented design means that you can stack books, magazines, CDs and DVDs on the shelf, so that it looks as though they are perfectly balanced on top of the peg. Another unique item from the Swedish company KARL ANDERSSON & SÖNER. Kids grow up so fast it makes us sad sometimes. The Danish Self Taught Artist Poul Pava has managed to extract the child within us all. 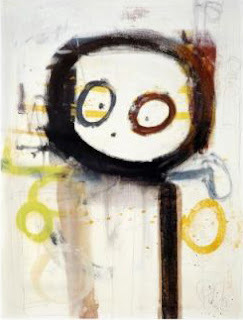 His spontaneous and naive style are so refreshing it makes us happy again. Lauren Dicioccio's work investigates the physical/tangible beauty of commonplace mass-produced media-objects, most recently: the newspaper, magazines, office papers and writing pads, plastic bags, 35 mm slides and bottles of water. The tedious handiwork and obsessive care she employs to create her work aims to reminds us of the simple but intimate pieces of everyday life. It reminds us that we're thirsty for more cool art! 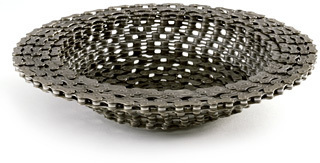 This industrial looking bowl is made from the most unlikely medium, recycled bike chains. With a great weight and classic shape they are perfect on an entry table for your keys etc. the end of the day. 10" diameter x 2" deep. 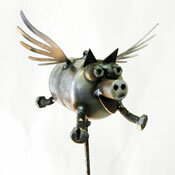 Resource Revivalcreates fun, functional products from recycled bicycle parts. Every year, bike shops all over the United States send tons of tons of greasy used parts. Their team of artists tinker with them until new products are born. New doesn’t mean better. 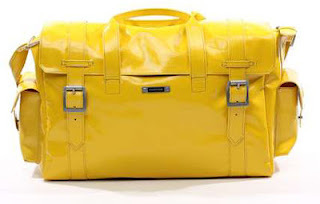 At least with FREITAG, new means just as good. FREITAG REFERENCE is crafted from the same fine recycled truck tarpaulins as the original-only that the optical selection process and washing is even stricter. The same quality fetish is applied to the stitching. So if you buy this travel bag, be prepared to pass it on to the next generation. Here's more on their incredible story. Like the idea of a workspace you can close up when not in use? 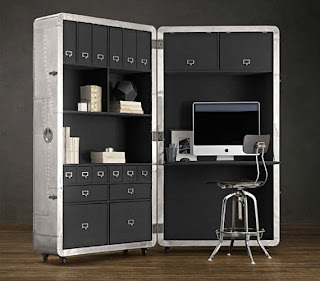 Then check out the Blackhawk Secretary Trunk. Inspired by fuselages of mid-20th-century aircrafts, the facade of the trunk features polished aluminum panels and steel screws. The distressed finish and intentional nicks give it a vintage feel—which also means that it won’t matter if you’re kind of rough on your stuff.